I am a Spanish teacher and artist living in Moorhead, MN. Being appalled by the actions taken by our government during the Postville Raid of May 12th, 2008, I have been following its aftermath closely. I would like to bring Postville to the world and help others hear the voice and see the face of those individuals affected by this tragic event. I’m also an advocate for immigration reform and for the humane treatment of all people – especially the poorest of our world. I strongly believe that we must see beyond borders and realize that our destinies are entwined in many ways. Postville Loteria is based on the popular game of chance often referred to as Mexican Bingo. There are 36 images that are inspired by the lives and stories of immigrants, especially those involved in the Postville Raid. Each image is hand-sewn with scraps of felt and is 9 x 12” in size. I chose to use felt as a medium for a variety of reasons. The felt pieces seem to have a profound impact on the viewer. Felt is a material associated with childhood projects. It comes in vibrant and appealing colors and has an inviting texture. The viewer anticipates pleasant images and is shocked by the harsh realities conveyed. Also, the time-consuming nature of sewing by hand allowed me to reflect on the circumstances and subjects which inspired each piece and connects with the crafts that originate from Guatemala and Mexico. So many women in the world make beautiful pieces coveted by collectors and tourists, yet they are so often unable to support themselves and their families with the proceeds from the sale of their crafts. 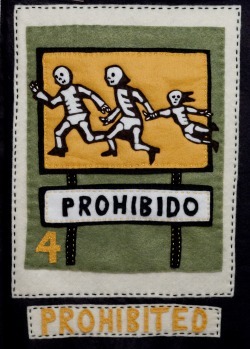 Postville Loteria is a visual arts series which has been converted into the game itself. It is meant to be viewed as well as played, allowing the viewer to interact with the art. The game consists of 36 image cards and several game boards arranged randomly in a pattern of 3 x 3. It is played much like the game of Bingo. A caller calls out the name of the image--often followed by a riddle or a rhyme–and the players mark that piece on their board with a bean or bottle cap. The first player to make the predetermined pattern (3 across, black-out, etc.) calls out “Loteria!” and wins the game.